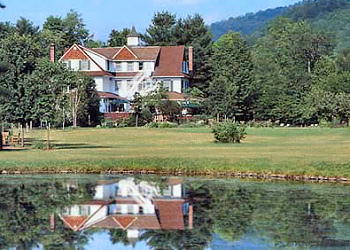 The Beaverkill Valley Inn Bed and Breakfast of Lew Beach New York. The Beaverkill Valley Inn is a country inn with full amenities located in the heart of Catskill State Park. Private fishing access on the Beaverkill and year-round access to outdoor activities. Listed on the New York State and National Register of Historic Places, the Inn was built in 1895 as a trout fishing lodge. Get away from the city and reconnect with nature. We offer understated elegance and premiere service in a serene setting.